Dr. Banting occupied three of the rooms of Banting House NHSC while he lived here from June 1920 to April 1921. His office and bedroom tend to get a lot of attention and hold meaningful messages about Banting and his time in London, but what about the third room? Banting used his third room in the house as an apothecary. It was located right beside his office, so he could run to it quickly for any supplies he needed that were not in the office with him. The apothecary was a small room that had been used by the Hill family as a pantry. The Hill family and Banting actually shared the cupboards in the room. We can only imagine how interesting navigating between the cupboards would have been, if Banting’s had contained medicines and supplies and the Hill’s had food in them. The Hill family would have had to be careful if they went looking for a midnight snack that they didn’t grab some of Banting’s medicines by mistake! Banting would have used the apothecary would have been used to store a small collection of commonly used medicines and medical supplies that a doctor of his time would have used to help patients. Banting would have been able to give his patients small amounts of medicine, but if a patient needed a prescription filled, they would have had to go to the local apothecary to have it filled, just like getting a prescription at a drug store today. This would have been the case for Dr. Banting’s first patient, who came in for an alcohol prescription during Prohibition. There are only a few details about how the apothecary would have looked when Banting was in the house, and so the room is set up to look like what an early 20th century doctor’s probably would have looked like. It has a number of vials and bottles that represent some of the common supplies a doctor would have had on hand at the time. One of these includes a bottle that held silver nitrate. Silver nitrate was used as a disinfectant before modern antibiotics were developed. Another item that is featured on the shelf in the apothecary is a box of surgical ligatures that Dr. Banting would have used if a patient needed stitches. There are also a couple of examples of mortars and pestles which were used to grind, crush, or mix medicines together. In addition to the supplies, Banting had a sink installed in the room. This would have made it easier for him to clean up his office or wash his hands before he prepared any medicines for a patient. The sink is still in place in the room today. The Apothecary at Banting House NHSC. 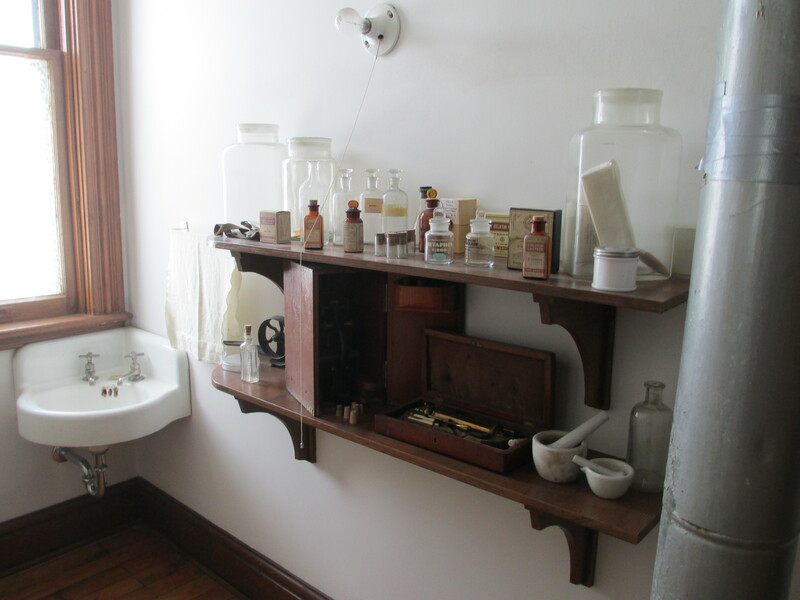 There is a collection of medicine vials and bottles on display, and the sink that Banting had installed when he lived in the house can also be seen. The apothecary in Banting House NHSC may be small, but it has its own share of interesting stories and connections to Banting’s work and time in London. It would have been an important behind-the-scenes part of his practice that his patients probably would not have thought much about, but the supplies it held would have helped them on their way to recovery. This post was written by Taryn Dewar, Graduate Research Assistant at Banting House NHSC. Taryn is a Masters Candidate in Public History at Western University. Posted in Uncategorized.Tagged Banting, medicine.